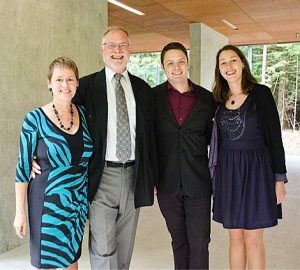 The trustees of Viaduct Foundation; Cindy Macie, Ross Thomas, Craig Thomas, and Alexandra Thomas. Viaduct Foundation is a family trust established for the advancement of education in the world’s least developed countries. We believe that education is a significant contributor to meaningful, long term improvement in not just the standard of living, but also the standard of life. We are registered with the Charities Directorate of the Canada Revenue Agency as a private foundation. A private foundation may carry out charitable activities directly, however we do not; we only make gifts to other registered charities working on education projects in our target countries. Most of our revenues to come from endowments, but as a registered charity with the CRA we can issue tax receipts for donations! We invite you to explore our website to find out more about Who We Are, What We Do, and What You Can Do. If, after reading about our ideas and plans, you are inspired to contribute, please click the Donate Now link at the top of any page. And please sign up for our MailChimp newsletter.